Thirteen-year-old Karlene Bridges is the best speller in her family, her hometown, and maybe even all of Shirley County, South Carolina. The trouble is, every time she makes it to the final round of a spelling bee, she chokes. But when Mrs. Harrison, the new Latin teacher, offers to coach her, Karlene's spelling jinx miraculously disappears. The year 1969 is turning out to be her best ever, especially since she develops a surprising crush on her best friend, Billy Ray. But as soon as Karlene aims to compete in the National Spelling Bee in Washington, D. C., her father's drinking begins to spell trouble. How is a girl supposed to hold her family together, savor her first kiss, and become the best speller in America before the end of eighth grade? Debut novelist Karon Luddy spells out adolescence with unwavering faith and sass in a novel about big dreams and the people who make them happen. Karon Luddy earned her MFA in creative writing from Queen's University of Charlotte, North Carolina, where she lives with her family, and teaches writing to college students. 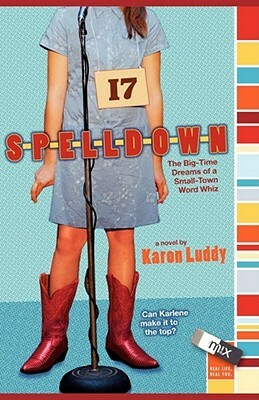 Spelldown is her first novel.